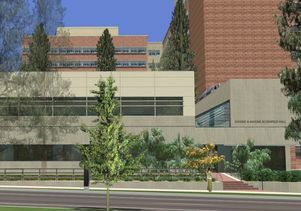 “The philanthropic partnership with the Rosenfelds will revolutionize UCLA’s facilities to maximize knowledge, giving the David Geffen School of Medicine a competitive advantage and leading to greater health care efficiencies and more personalized patient care,” said Dr. Kelsey Martin, dean of the school, in a statement. “In real estate we do see eds and meds sometimes adding significant value to an area,” notes Paul Habibi, Continuing Lecturer of Finance and Real Estate at UCLA Anderson School of Management. An area with a highly ranked medical center and university often has added value to an area providing it has good solid dynamics for desirability. A university provides an educated population, strong infrastructure and certain amenities, Habibi adds. [Patricia] Bath then became the first female ophthalmologist at UCLA and she didn’t stop making history there — Bath went on to invent a new device to remove cataracts from the eye, called the Laserphaco Probe, which made her the first black woman to receive a medical patent. Her brilliant invention has helped restore vision to people all over the world. Paul Warren, a meteoriticist at the University of California, Los Angeles, was the first to notice what has come to be called the Warren gap. He gathered measurements of chromium and titanium isotopes for two meteorite types. Those metals, forged by the explosions of dying stars, were mixed throughout the disk of gas and dust from which planets and asteroids took shape. A February study by the University of California Los Angeles showed that Latinos are underrepresented in all areas of the entertainment industry. While Latinos are 18 percent of the U.S. population, they account for just 2.7 percent of all top movie roles in 2016, and around 5 to 6 percent of roles on television.